While there are free embroidery design programs available, they don’t offer the range of functionality that you get from Embrilliance and other paid-for programs. If you are just looking for a bit of fun, or only intend to do a couple of projects for yourself, then a free program may meet your needs. However, if you do a lot of embroidery, and are looking to create unique designs, you’ll definitely need to invest in one of the design programs in this round-up of the best embroidery software. 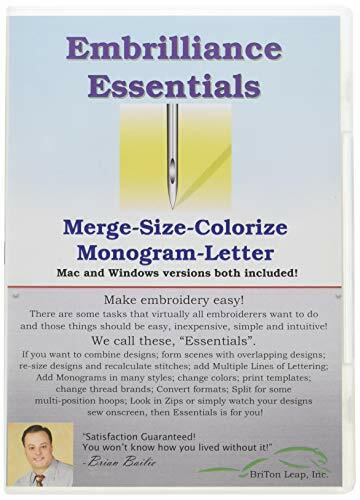 Embrilliance Essentials is an embroidery design software for use with computerized models. It is compatible with both Mac and PC, making it one of the most flexible digitizing software options out there. In addition, Embrilliance can write to either a USB flash drive, or even (assuming you can still get hold of one!) a floppy disk. This means Embrilliance can be used even by those with older computers or computer compatible embroidery machines. Embrilliance is fairly easy to use, although it does require basic computer awareness. If you know about unzipping files, you’ll find Embrilliance a breeze. And, if you don’t, there’ll be an easy-to-follow online tutorial for just that function, if not for Embrilliance software itself. While there is a wider range of Embrilliance products, most people purchase the Essentials package; it covers everything most people need and want. The price is comparable to other embroidery design software available. Embrilliance Essentials allows you to merge and resize designs, and customize lettering fonts for monogramming, as well as changing the color of a pre-set image to suit your style or project. This clever little tool reduces the hassle of adding text to your designs – instead of fiddling about trying to get letters to overlap or finding the right kerning (the space between characters) – this software does it for you. It gives you a lot of freedom in your designs, and makes things possible that would take many hours of frustrating trial and error. Everyone loves it – the only complaint is that there’s a learning curve to using it and the instructions aren’t really good enough. Once you’ve hunted down some online tips or Youtube tutorials, you’ll be glad you bought this. While Embrilliance is certainly one of the strongest embroidery design programs on the market, it isn’t the only one (check out our review of StitchArtist from the same company). Depending on your level of expertise, your workload volume, and the kinds of projects you’ll mostly be working on, there is a fairly good selection of embroidery design software to choose from. Do make sure it is compatible with your equipment before you purchase, however, as you don’t want to be disappointed. If you don’t yet have a digital embroidery machine – buy one! The increased range of images and text styles you’ll be easily able to add will make the purchase more than worthwhile. If you sell your embroidered items, at craft markets, for example, a good model and the appropriate digitizing software, allows you to offer unique and customized products. When you spot a rising trend, you can easily carry that trend onto your items. Here are just a few of the other leading design software packages available. 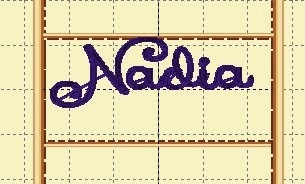 This program is a good, basic starting point for the home embroidery enthusiast. It also has the benefit of offering a free 30 day trial, which is an easy and cost-free way to learn the software before you purchase. That way, once your purchase is made, and your product arrives, you can get stuck right in with enjoying it, with no hassle or frustrations. Digitize ‘n’ Stitch is not compatible with Mac computers, and does require MS Paint to be installed. It is also worth noting that you will need to be prepared to invest time and patience in editing color-rich graphics. The program is highly perceptive, and will often identify very subtle colors that you hadn’t noticed in a graphic. Sometimes, this can spoil the overall look of the graphic, but, with careful editing before you digitize your file ready for embroidery, this can be minimized. Amazing Designs also has a range of other digital embroidery software packages, focusing on individual elements, such as fonts. This one allows users of some Singer embroidery machines to create embroidery designs from photographs. This is a nice touch for quilts that are being made for wedding or baby shower gifts, and an attractive way to present a favorite photograph. There is a need for a fair amount of time spent editing in order to achieve good quality results. You will also need to ensure you purchase the specific software for your Singer embroidery machine, as this software is not transferable across the Singer range. Photostitch does have quite a steep learning curve, and it does require patience. Therefore, it is more suited to those with experience in digitized embroidery. It is also important to note that Photostitch can only be used for photographic files, not for text or other images. For most embroiderers, it would be more cost-effective to purchase a comprehensive design package which can deal with more file formats. Buzzword 2 is easy to use, and offers a lot of choice, with 49 built in fonts and over 40 fill patterns to choose from. It also provides the ability to import and arrange your own designs, whether or not these use lettering. Buzzword is a fonts-only program itself, although, as mentioned, it does have the functionality to allow you to import your own image-based designs. This software is not compatible with Mac computers. Finally, this software from Brother is more of a file transfer package, although it does offer basic design and editing functionality. The PED Basic package includes a CD-ROM of editable designs, a USB card reader/writer, and a blank memory card, for saving your finished designs. There is also an instruction manual to guide you through setting up and using the package. PED Basic is only compatible with Windows/PC. It will not run on a Mac computer. 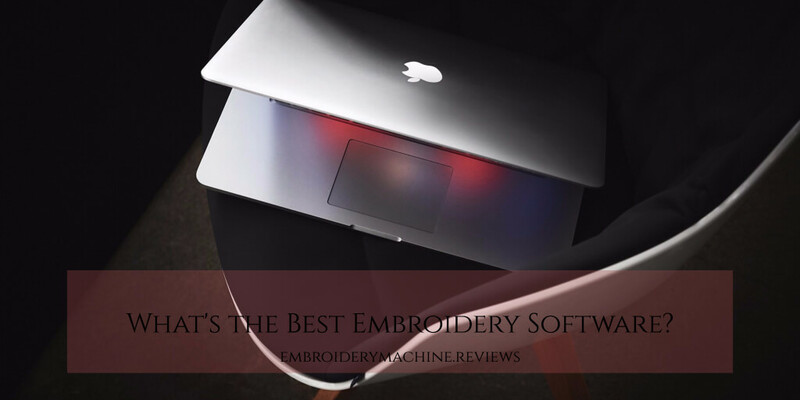 In summary, if you are looking for the best software for embroidery machines, with a broad scope of functionality, Embrilliance Essentials is probably your best bet. If you are a Mac user, then Embrilliance is, at the moment at least, pretty much the only viable option out there. Whatever you choose, we hope you make a wide variety of amazing designs with your new embroidery software.